Hello, good night all !! I will introduce an ICO that is related to the New Paradigm of the Internet if we discuss it here. !! The 1960s history of Internet began with the structure of packet-switching network. The first paper on the current computer-mediated communication method of packet-switching theory was published in 1961 by Leonard Kleinrock from MIT. In 1969, a protocol for internetworking was developed where several distanced networks could join together on a single network. With the appearance of PCs and 1200bps modems in the mid 1970s, a decentralized model of CMC (computer-mediated communication) network emerged. Meanwhile, the development of Ethernet made a big contribution to the expansion of Internet users. This is a kind of Local Area Network (LAN) expansion, and it is the most standardized model of the current Internet network. Until the 1970s, the scale of the network began to expand dramatically from the development of standard systems and applications. So what kind of project is Grabity? 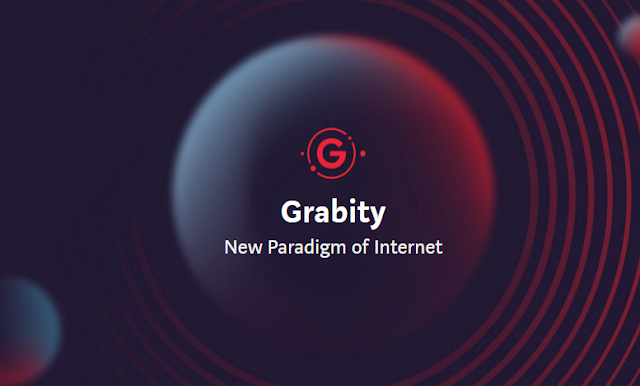 Grabity is a public Blockchain project, for the transformation of the Internet paradigm from centralized network to a distributed network. Current hardware performance has improved dramatically, even enough for smartphones to have better performance than previous servers. However, it does not use 100% of storage space or computing power. Anyone can share computer resources through already-possessed idle devices such as smartphones, tablets, and PCs, and users can receive rewards as much as they provide resources, and DApp developers can use the shared computer resources to operate services at a lower cost. When the Grabity project reaches the commercialization stage, anyone will be able to make the use of distributed nodes to switch the Internet paradigm. The Orbits Network is Grabity's decentralized main net that draw a truly distributed P2P network by utilizing all wired/wirelessly connected idle computer resources. Transactions from Orbits Network are managed efficiently through using Genesis Hoisting technology, which can process transactions simultaneously and quickly. In addition, Smart Contract and resource files can be stored in separate portions into each by using the distributed storage technology and Defrag Function technology that can recall each part and execute in a streaming format. Network layer: P2P-based overlay network. Verify and then propagate the transactions between nodes through the layer. The principal is to make the most use of basic network bandwidth. Data Layer: Blockchain data structure and physical storage space. Includes Merkle Tree, Hash Function, Data Block, digital sign and etc. that store blocks and DApp files containing the transaction history. Consensus Layer: Node that generates a transaction directly verifies its own transaction, and the transaction that has been verified by majority of certain nearby nodes is generated as a block. This is distributed to other nodes, and if there are any nodes that is determined to be malicious attacks, the transaction details are initialized and synchronized to the verified transaction details. Application Layer: Provide the application interface on top of the Blockchain. Smart Contracts, virtual machines, DApp, etc. are included and directly linked between the data users. Management Layer: Toolkit and SDK are provided to form the development of ecosystem and located the 3rd Party. Consumers who need computer resources should purchase GBT. GBT is DApp's main currency, and if DApp's users increase, demand can increase. The reward for providing computer resources after the main net launch can be expected to increase the demand for GBT, determined from the additional computer resources and GBT. The initial 10,000,000,000 GBT for the development and operation of the project are issued from the Ethereum network. The ERC20-based GBT will be replaced with the Orbits Network-based GBT after the main net launch. In addition, since the main net, GBTs are issued in addition to consideration of the inflation rate for the purpose of compensating computer resource providers. The rate of inflation can be flexible but will be determined in a way that does not exceed 5% to protect token holders and ecosystem participants. Grabity launches an official bounty campaign.